WRIGLEYVILLE — A $1 million grant from the Chicago Cubs will double the number of security cameras around Wrigley Field and bolster surveillance to major streets leading to the ballpark. The grant is expected to go before the city's budget committee on Wednesday, and its approval will mean the installation of 30 security cameras this summer. "It's a great investment in safety, and we're glad they're doing it," said Bennett Lawson, chief of staff for 44th Ward Ald. Tom Tunney. "If we can add cameras and private security, that takes a load off the police." The cameras, which will be connected to the city's network of surveillance cameras, are the latest step by the Cubs to enhance security amid a surge of interest in the World Series championship team. "We've always had a very high influx of visitors for Cubs games, and winning the World Series magnifies that," Lawson said. "Not only is the stadium full, but the neighborhood is full, especially during the postseason." Since January, the Cubs have paid for two off-duty officers to patrol the streets of Roscoe, Wilton, Racine and Grace, with daily coverage during the baseball season. "We've made a substantial amount of progress in regards to safety, but we're not going to rest," Tunney said in March. "We cannot do enough." 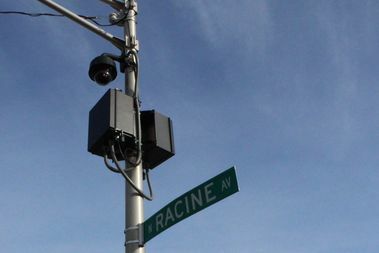 The cameras will be placed on city-owned light poles mainly on Belmont Avenue, Addison Street, Irving Park Road and Lake Shore Drive, officials said, although the exact locations still are being determined. A few will be on Grace Street near Wrigley Field, but the majority will be on major thoroughfares surrounding the ballpark. A few will be placed west of Western Avenue as far as the Kennedy Expy., Lawson said. Along with Lakeview, the cameras will extend into North Center, Irving Park and Avondale. Within the 44th Ward, 11 cameras from the Cubs' contribution will roughly double the number of police cameras on the street, Lawson said. About five years ago, the city used federal Homeland Security money to install cameras on the four corners surrounding the ballpark, Lawson said. There are about five more in the ward, including one at Wellington and Sheffield that Tunney purchased with an estimated $27,011 in 2016 infrastructure menu money. During major events like the Pride Parade or the Cubs' postseason, the Office of Emergency Management and Communications also places portable cameras on poles on busy streets. "The additional cameras will serve to enhance the safety and security of [Wrigley Field] and allow OEMC to monitor the high-traffic areas in communities adjacent to the ballpark," said spokeswoman Melissa Stratton. "The expansion will increase OEMC's ability to view additional areas of the city during an emergency incident." Each camera and its installation will cost around $30,000, Lawson said. That basic model of camera does not come with the blue flashing police light, nor is it made of bulletproof material. 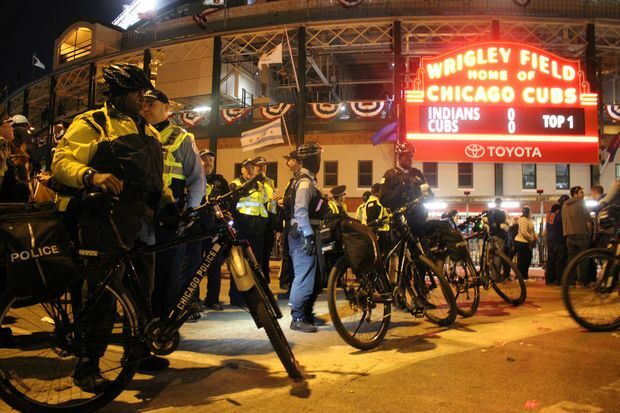 The Cubs aren't alone in their efforts to boost security in Lakeview. The Lakeview East Chamber of Commerce hired private security to patrol its half of the neighborhood earlier this year. To the west, the Lakeview Chamber of Commerce is introducing a rebate program for security cameras and exterior lighting in the hopes of encouraging safety upgrades for property owners and tenants. "We've got extra security now in areas where we didn't, which I think frees up the police a little bit," Lawson said. "Just like having traffic control aides means you don't have an officer directing traffic." Typically dressed in reflective yellow vests, the security officers don't have the power to arrest offenders, but instead serve as surveillance teams that alert police when needed. In the laast year, Tunney and 46th Ward Ald. James Cappleman have pushed for more police in the Town Hall District, which includes Lakeview and portions of Uptown, North Center, Lincoln Square and Lincoln Park. While there are still more than 50 fewer police officers covering the district compared to when it merged with the 23rd in 2012, at least 50 more have joined since October 2015. • Was The $18.8 Million Cubs World Series Bill Worth It For The City?